These promo images are sweeping the net up in a fervor, originating on one of the official Cardfight!! Vanguard twitter accounts. 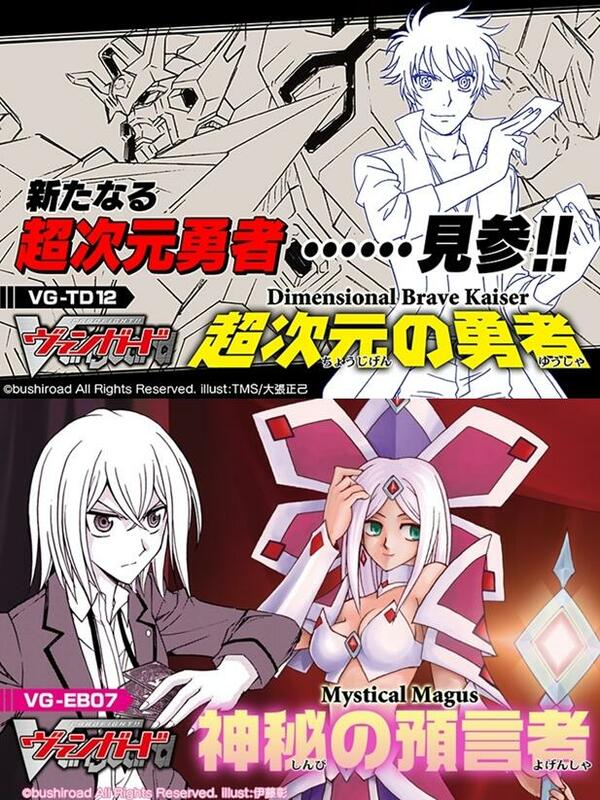 The advertisements have revealed the twelfth Japanese trial deck, VG-TD12: Dimensional Brave Kaiser, which will be the first trial deck for the Dimension Police clan. The deck's cover character is Mitsusada Kenji, otherwise known by his nickname Koutei or "Emperor." Koutei has not been seen in the anime since going overseas to study at the Singapore Institute of Technology, and his return likely means that his Team Caesar will also enter the spotlight once more. The TD-12 tagline is　「 新たなる超次元勇者......見参！！」　"A new Super Dimensional Hero...appears!!" possibly referencing the previous Dimension Police boss card Super Dimensional Robo, Daiyusha and his transformation into Ultimate Dimensional Robo, Great Daiyusha. Note that while 超次元勇者 would normally be translated to "Super Dimensional Hero/Brave," this is also the name of the set "Dimensional Brave Kaiser." Rather than introduce a new subgroup, the twelfth trial deck will reinforce the existing Dimensional Robo series, including a new break ride unit. Four new cards from TD12 will be exclusive to the trial deck, while four others will be reprinted in BT13. Along with this announcement comes the reveal of VG-EB07: Mystical Magus, the seventh extra booster overall and the second to exclusively support Oracle Think Tank. Extra Booster 7 will introduce break ride support for OraThin, but notably both the Lozenge Magus on the set's cover and the illustration of Tokura Misaki are rendered by manga artist Itou Akira. While Itou is Cardfight's chief creative influence and the father of the franchise, the third season Link Joker in particular has been noted to draw many ideas from him directly, hence how closely it matches the manga's storyline compared to previous seasons. The extra booster is currently stated to focus on Misaki's manga playstyle, the Magus and Battle Sister series, as well as cards that will combo with an upcoming promo card from the sixth volume of the manga. It is currently unknown how closely EB07 is tied to Link Joker, but the current speculation is that Misaki will be returning to her original clan at some point in the third season rather than continuing to study Genesis, in order to better match up with her manga counterpart. VG-TD12: Dimensional Brave Kaiser will be released on August 9, 2013 while VG-EB07: Mystical Magus will be released on August 30. EB07 will contain 35 cards in all, 14 new and 21 reprints, with 2 RRR, 5 RR, 8 R, 20 C and 4 SP prints.